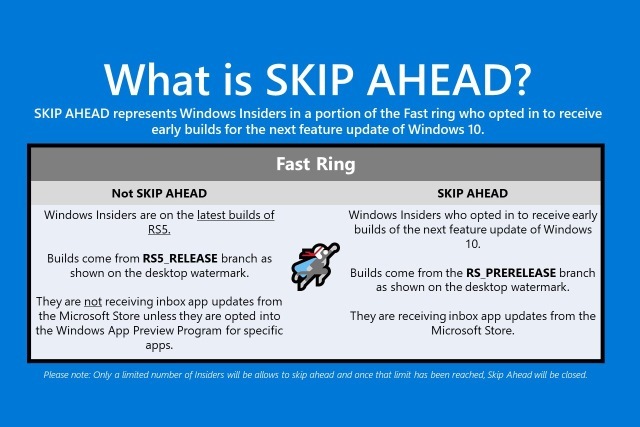 Microsoft has announced that the Skip Ahead ring has been opened for people who want to get the first look at the Windows 10 Redstone 6. Back with the release of Windows 10 build 17713, Microsoft announced it was "doing a complete reset of Skip Ahead". This is now complete, so you can sign up for the preview ring once again. Spaces are limited, so if you want to take part you're going to have to be quick -- once the maximum number of participants has been reached, Skip Ahead will close once again. Opting in to the Skip Ahead Ring means getting even earlier access to future builds of Windows 10 than those signed up for the Fast Ring. Builds come from the RS_PRERELEASE branch and with development of Redstone 5 coming to an end, joining Skip Ahead is the fastest way to see what's in store with Redstone 6. Joining Skip ahead is simple. Open up Settings and head to Update & Security before moving to the Windows Insider Program section. From the drop down menu labelled " What kind of content would you like to receive? ", select the "Skip ahead to the next Windows release" option.